Entry for 's "Tell me what you mean" contest. I wasn't really planning on entering, since I've been pretty busy lately, and shouldn't even be on the computer right now >__< But wanting to procrastinate, I suddenly had this urge to try something. "A king never dies, just sleeps." and I immediately thought of Lelouch. I found this scan, which was perfect for the idea I had. For the background, I used this scan. The hardest part was figuring out where to put sleeping Lelouch, and fit him in the environment without looking awkward... and also to block out Suzaku and sitting Lelouch (taking out Suzaku was especially challenging, 'cause he's exactly where I don't want him to be XD), oh, and manipulating those annoying chains. Lots of cutting and pasting and sewing and cloning later, this is the result. Non-wide screen looks better 'cause less is cut off. But I've put up wide screen versions at EDD. Excellent work! Lelouch' extraction and position is pretty much flawless considering the original scan. his presence in the wall. 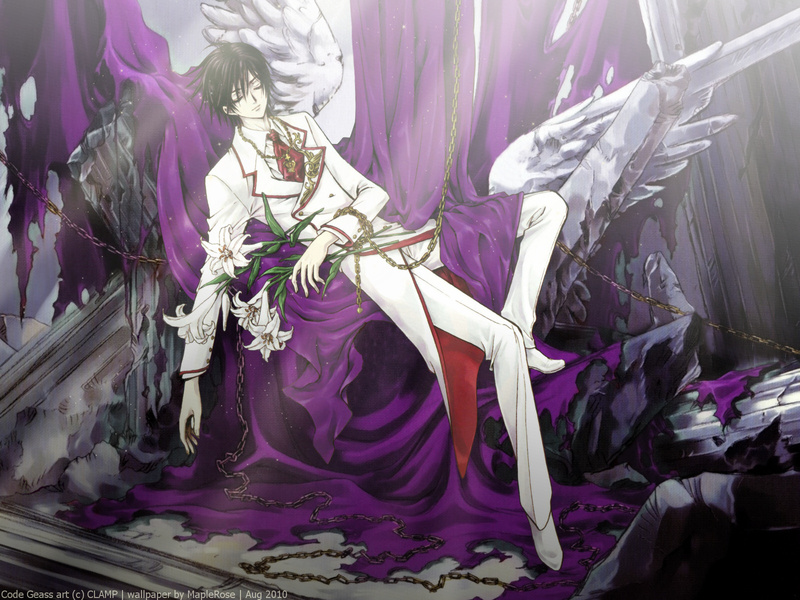 huge fan of lelouch! I love the colours! Kinda misses CG and lulu. This one is so peaceful and i do like the lighting effects. Awesome job as always! good luck with the competition! ^^, +fav! waw! cool! haha. random generators are always good sources of ideas..
i loooooooveee this! amazinggg! great work! Beautiful.....absolutely gorgeous. He looks way too angelic to be true, XD . The title is very fitting as well, great work. I adore this. The execution is stunning, of course, and the colors and lighting are wonderful. And it's for my contest! *dances* Good work Maple! Execution is beyond amazing! I'm in awe with the effects and beautifully lighted areas, and the deep colors blended so well. This is a gorgeous work of art.